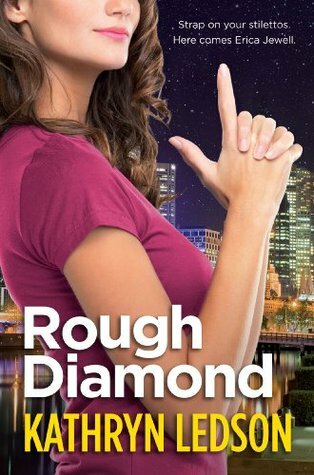 Synopsis: Funny, romantic, and action-packed, Rough Diamond introduces Australia’s own Stephanie Plum – the unforgettable Erica Jewell. The shock ending to Erica Jewell’s marriage left a huge hole in her bank balance and a bigger one in her heart. And now her life goals make a very short list: no surprises, no debt and, definitely, no men. That is, until she finds one bleeding to death in her Melbourne garden one stormy Friday night. Jack Jones is a man whose emotional wounds are more life-threatening than the bullet in his shoulder. Under orders, he recruits Erica to his secret team of vigilantes, and Erica suspects her safe, predictable world is about to be turned upside down. And she’s absolutely right. Review: I saw a very nice review of this novel a few years ago and it is true that I kept it in mind until now … The problem? Because of course there is one, it is to find it. The author being Australian, it is quite difficult to obtain a copy of her book. Besides, I find myself once again with the same concern to read the second volume that I am impatient to have! We discover Erica, a banal young woman who after discovering her husband cheating on her, ruining and deceiving her, decides to start over. But when she comes home one night to find a man dying outside her door, Erica does not expect her life to change that much. As he seems to know her, our heroine does not hesitate to help him without warning the police when it seems that something terrible happened : one the main ingredient to create bombs had been lost and everyone is very worried about the possible consequences of all this. She therefore finds herself embarked in a story that goes beyond her and that will place her in terrible situations. Forced to work with Jack, the man she saved, Erica is going to be hired in “The Team” to try to thwart the plans of the terrorists. It is very difficult to tell you more or to explain not to reveal too much in the face of the complexity of the story and the characters but I can tell you that I had a great time with this first novel. We easily connect to Erica by fully understanding her attractiveness, naivety and mistrust and yet, whatever one does to her, she always gets empathy with those who hurt her and it starts with her husband. And what about Jack? We can only fall under his charm and despite what he presents to others, it is a character much more complex than we might think. It was very interesting to learn to discover him and to know some bits and pieces of his past. We hope throughout the book that a nice relation between the two characters would appear but nothing will be really simple especially when we take into account their wounds. The author presents us with a story full of action, plots and colorful characters, and I confess that I had a hard time putting the book down before finishing it. I was really looking forward to know the end of the story and what the next catastrophe would be. And I can tell you that there will be several! To conclude, it was a very nice discovery and I had a great time with the characters. The end surprised me a bit, but I’m curious to read more. This entry was posted in Chick-Lit, Erica Jewell, Kathryn Ledson. Bookmark the permalink. This sounds like it is definitely an interesting read. You got me with the guy on her doorstep. I have to know what all of that is about. I’d like to find a hot guy sitting in front of my door. lol Sounds like a good book. right? I would like that as well! Oh looks like you found a fun one! Does make me curious! It is so hard to get hands on international writers! Don’t you love when you don’t want to put a book down because it is just that good?!?! This sounds like it would a good one for me too. I want to read this to experience the colorful characters! Sounds like a really interesting book, and the characters seem great. That’s awesome you were able to finally get a copy. This one is completely new to me. I would imagine it could be hard to get a book from another country. It sounds like it was a really well done story. I am so glad you enjoyed it. I love that it surprised you. Glad you tracked down a copy. It sounds like you enjoyed this story a lot and I feel your pain in having to wait for the next book!